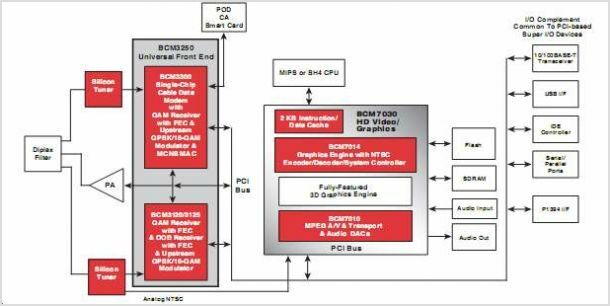 The BCM7030 Advanced High-Definition, Video-Graphics Subsystem supports the requirements of interactive Television and set-top box systems that require high-definition or standard-definition decoding of MPEG-2 streams with simultaneous high-definition and standard-definition outputs. The Video Decoder also supports multiple stream standard-definition decoding, providing both tiled Video and PIP capability. Supports recorder playback up to four channels. The BCM7030 graphics are based on Broadcom's advanced Video graphics technology that allows studio-quality text and graphics to be displayed on television-based systems. The graphics compositing engine allows for many windows of graphics and Video to be layered with blending and antialiasing, creating high-quality, rich Display capability. BCM7030 Pinout will be updated soon..., now you can download the pdf datasheet to check the pinouts ! This is one application circuit of BCM7030,If you need more circuits,please download BCM7030's pdf datasheet.